153 musicians needed to save 153 bird species from mining magnate! This is what magnate Clive Palmer has planned for Bimblebox Nature Reserve only 50 times bigger! 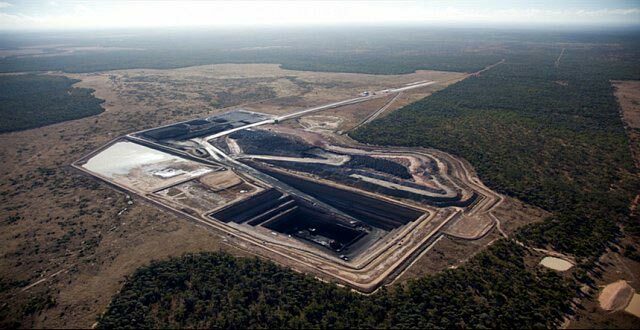 The nearby Alpha Coal test pit. The amazing Bimblebox Nature Refuge in central-west Queensland is threatened by proposed long-wall and open-cut coal mining. It is home to around 153 bird species. We are working with a group of artists on the Bimblebox Art Project. The aim of this art project is to highlight the threat to Bimblebox Nature Refuge, to document Bimblebox creatively and to show Australians what we are at risk of losing. For our work we want to record 153 musicians playing their interpretations of one of the 153 Bimblebox birds' calls. We have compiled a list of bird call mnemonics and onomatopoeias for the score. These will be heard from speakers in 'Coalface' an installation created by us: Alison Clouston (visual artist) and Boyd (musician/sound artist). He will send you the written description of a particular Bird call. You record your interpretation of the written call and send it back as mp3 or wav file via email, mail, Dropbox or similar. Boyd will edit all the calls together for the installation soundtrack. He will also make them available to any of the musicians who want to create their own Bimblebox birds composition. Have a listen to our project BIRD CRY from the Grassy Box Woodlands that used musicians' bird calls in this way. Example: Bush stone-curlew Burhinus grallarius Voice: ‘eerie high-pitched wail’ ’eerie, a drawn out, mournful- ‘wee-ier, wee-ier, wheee-ieeer, whee-ieer-loo. Each call rises, strengthening, faster, building to a climax, then trails away.